SONG Qibin, WANG Zhe, WANG Yuling, LI Yang, LIN Shuang. Adipose-derived Stem Cells Promote Rat Schwann Cell Proliferation and Secretion of Nerve Regeneration Factors[J]. Journal of China Medical University, 2018, 47(6): 527-531. Abstract: Objective To detect the effects of adipose-derived stem cells(ADSCs) on proliferation of rat Schwann cells and secretion of nerve regeneration-related factors from Schwann cells. Methods ADSCs were extracted from Sprague Dawley rats, and surface antibody markers were identified by flow cytometry. 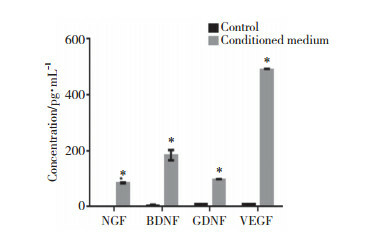 ADSC-conditioned medium was obtained and the contents of nerve regeneration-related factors (NGF, BDNF, GDNF, and VEGF) in the medium were determined by enzyme-linked immunosorbent assay. Schwann cells were incubated either with the ADSC-conditioned medium or with ADSCs. The effect of the medium and ADSCs on the proliferation of Schwann cells was observed by MTT. The levels of nerve regeneration-related factors(NGF, BDNF, GDNF, and VEGF) in Schwann cells were detected by Western blotting and real-time polymerase chain reaction. 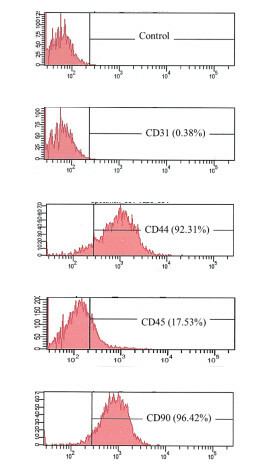 Results The evaluation of cell surface antibody markers revealed CD44 and CD90 positivity and CD31 and CD45 negativity, indicating that the extraction of ADSCs was successful. Enzyme-linked immunosorbent assay revealed that the ADSC-conditioned medium contained an elevated amount of nerve regeneration-related factors. MTT assay showed that the ADSC-conditioned medium and ADSCs can promote the proliferation of Schwann cells. Western blotting and real-time polymerase chain reaction showed that ADSC-conditioned medium and ADSCs could promote the expression of nerve regeneration-related factors in Schwann cells. Conclusion ADSCs can promote Schwann cell proliferation and secretion of nerve regeneration factors.